A good sleeveless blouse can be worn year round, making them well worth investing in as a wardrobe staple. The number one thing I look for when I buy new clothes is VERSATILITY! I love when I can wear a piece a bunch of different ways to get different looks. In fact, one of my personal rules that any piece of clothing must pass before I’ll buy it is that I have to be able to wear it in 4 different outfits. Even with dresses, I try to make sure I can create different looks with shoes, accessories, and layering pieces. Sleeveless blouses are fantastic for this. A good sleeveless blouse can be worn year round, making them well worth investing in as a wardrobe staple. Obviously, they can be worn when the weather is warm. But you can also create plenty of cute, trendy looks layering them in cooler months too. Let’s start easy. Find a coordinating cardigan, or even just a neutral cardigan, and voila! You’ve got a simple option for wearing your sleeveless blouse as the weather becomes too cold for bare arms. Dusters have been trending for a couple years and don’t seem to be going anywhere any time soon. 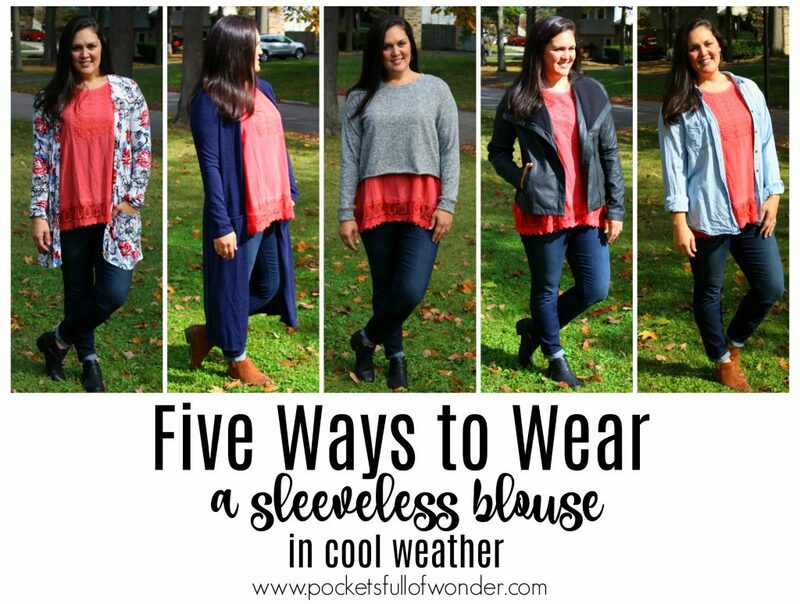 So if you’ve got a duster in your closet, it’s a fantastic option for warming up your sleeveless blouses. 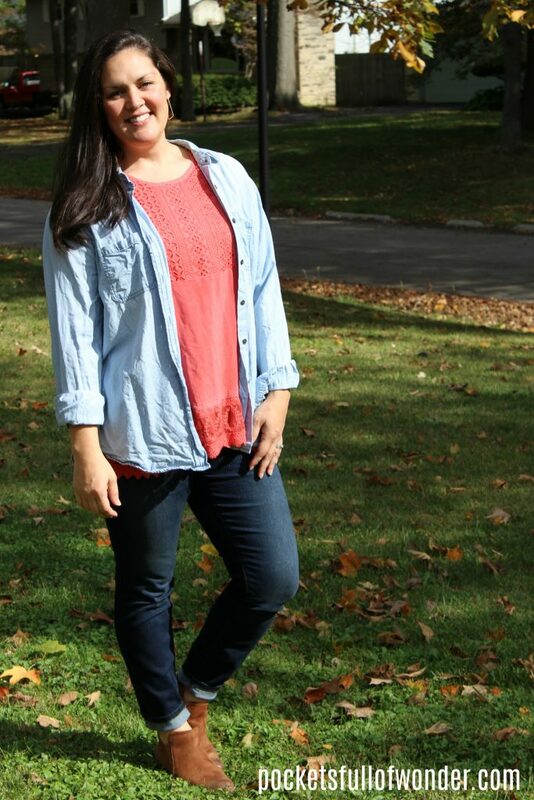 I LOVE me a good chambray top. Talk about versatility! Wear your chambray like a cardi and you’ve got another completely different look. An unbuttoned, untucked chambray top creates a more casual outfit and can be a fun contrast to a dressy sleeveless blouse. There is so much you can do with jackets and blazers. One of my favorites is a moto jacket. They are a hot item right now, but they are also a classic look that has been around for decades. The edginess paired with a delicate blouse is another fun contrast. 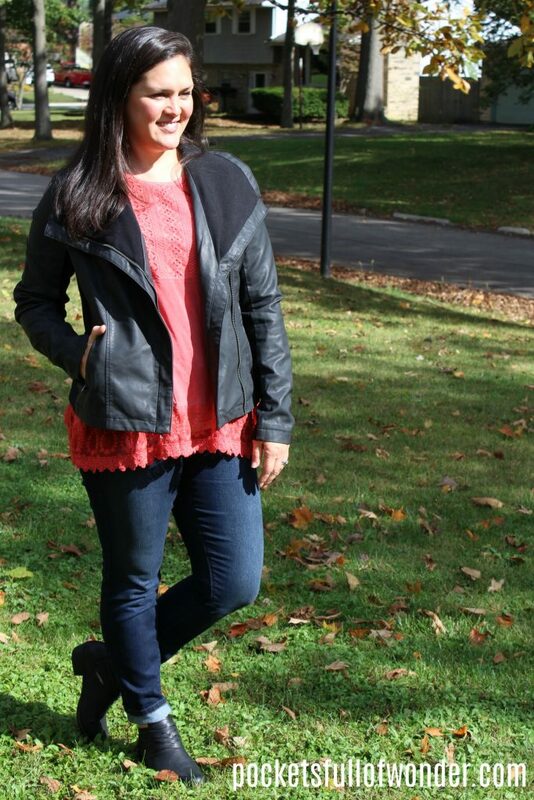 Denim jackets, army jackets, and blazers are all fun options too! Cropped Pullover Sweater is my favorite layering piece this season. I love how the flowiness or detailed edge of a tunic or blouse shows at the bottom. You get the best of both worlds – the dressy blouse and the comfy sweater. Here’s another color combo just to show you how versatile this look is.